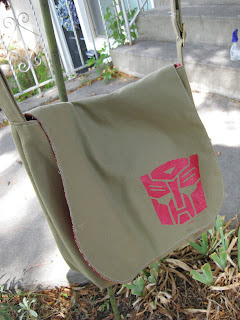 Lots of crafting, not so much of the doing the hair and all, so...here's another dummy picture of another accessory. This bow belt was made using the fabulous tutorial by Tilly. The only thing I did differently (to save a bit of time) was to use quilt binding. It was just the right width and already pressed. I'm most proud of the cost of this outfit. I got the shirt off the clearance rack at Papaya for $3. The skirt came from Walmart. It's actually two mini-Miley-skirts put together to give it that ruffle effect. I just added a bit of fabric to the top of the under-skirt to lengthen it because let's face it, I'm not Miley Cyrus and no one wants to see that much of my legs. Each skirt was $3. Not too shabby. The best part is that I can adjust the placement of the waistline of the skirt without affecting the length because they are two separate skirts. I can wear it at my waist or up for a high waisted look. I love a little variation in my wardrobe. Love the belt! 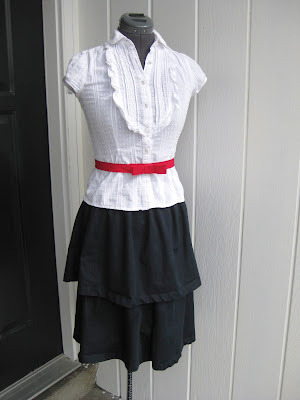 Great skirt idea- I have the same one and I'm not Miley either. hahaha. I made a white skirt the other day to use as a slip but I'm afraid the dark tint will rub off on it. Looks like I should be layering an already dark skirt. Genius. Ooh so great to see you used my tutorial! 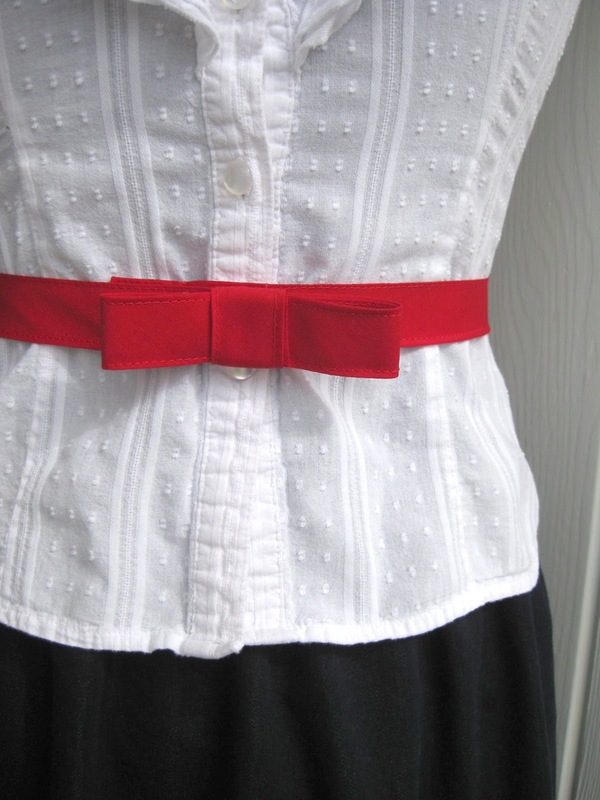 I'm doing a little blog post round up of bow belts that people have made. Would you mind if I used one of your photos and linked back to your blog? Can you email me or leave a comment on my blog to let me know if that's okay?